When the Day Was Young is The Mustard Seed Company’s latest serving of amateur English theatre, much appreciated by those who feel the dearth of English language plays in Goa. 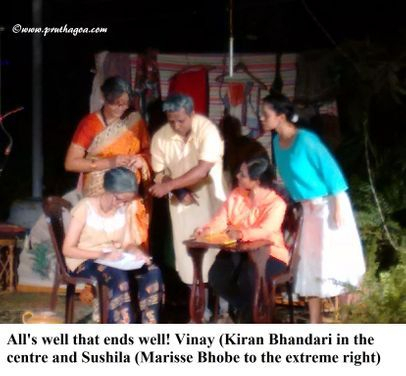 The play that was performed at Gomant Vidya Niketan, Margao, and in collaboration with Sunaparanta, Goa Centre for the Arts, Panjim, at the Sunaparanta amphitheatre, dealt with the age-old problem of seniors being relegated to homes for the elderly. The playwright, Isabel Vas, delves into the deeper concerns that affect the golden years with a touch of magical realism. The story begins with Bonita, an old woman, having a conversation with herself, and attempting to cheer herself up with some entertainment to keep her sanity. There is a supernatural being she communicates with who is not revealed to the audience. Sushila, the caretaker, or supervisor, of the old age home, is extremely ‘by the book’ and brooks no rule to be broken. A future political aspirant, Sushila is an uptight personality who is governed entirely by the idea of discipline and order. We learn that the home belonged to Bonita, who handed it over to the Jolly Senior Citizens Retirement Home Trust to be spruced up and opened to other seniors in search of a place to rest their tired bodies. Bonita’s children live outside the country and she was living in the house alone after her husband’s death. Madhavi becomes the next addition to the family, emerging from an unusual situation where her husband wishes to deposit her elsewhere because he has taken up with a younger woman. As the doctor at the home questions Madhavi about her husband’s health to ascertain the reason for him wanting Madhavi to go into an old age home, Madhavi says that he is very active. Bonita interjects with her witticism, ‘Very, very, very active, Dotor. He’s got another woman to be active with!’ The childless, gullible Madhavi is told that she will find a permanent place at the home only if her alcoholic, but affluent, husband, agrees to make a huge donation. Soon Vinay makes his entry. The well-travelled Vinay has been rejected by his son and daughter-in-law. He finds great friends in Bonita and Madhavi who take to his childlike demeanour and honesty. Unfortunately, Vinay is accused of stealing the home’s ambulance, though it is later revealed that the vehicle was taken by Madhavi’s husband who, in his drunken stupor, had mistaken it for his own white car. 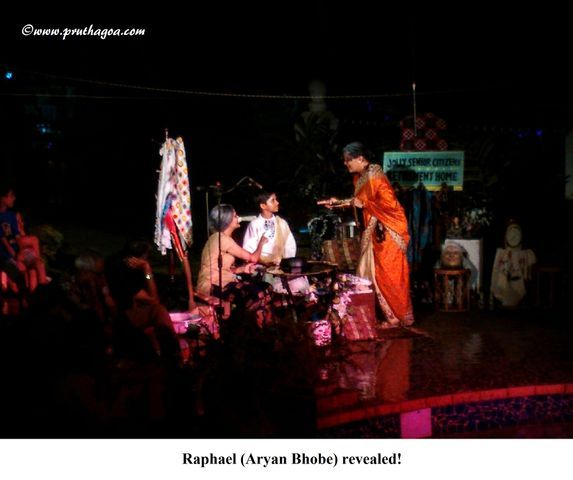 Bonita’s unseen magical friend appears to the audience after Vinay is accused and is shown to be an angel called Raphael. He is seen by Madhavi and Vinay as well. They are all encouraged by Raphael to create their own stories and assured that all will be well. This show of vivid imagination leads to the most improbable storytelling, but it effectively convinces Sushila and the doctor to run the home on the inmates’ terms, as if they were a family, rather than binding them in the constraints of ridiculous rules and ambitious dealings for the development of the home. The changes allow for the rules to be modified according to need, setting up a day-care centre for seniors, making use of the elders’ talents in the best way possible, and so on. 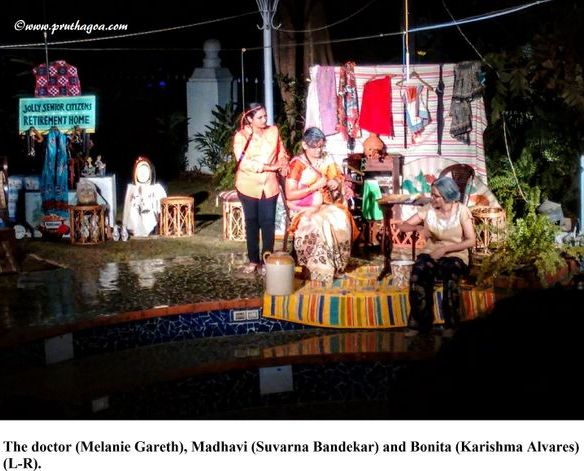 Aside from bringing to light the various reasons for the abandonment of older persons, the play stresses that life is not over for these people – old age does not signal dementia and the dead end of life, as is oft mentioned by Bonita. The imagination and vitality of spirit in seniors and the wisdom and knowledge accrued by them have their own part to play in the progress of society. This needs to be recognised by the younger generation, so that we can cherish the elderly for the treasure that they can be. An underlying focus of the play is the stringent rules in old age homes, as is seen in Sushila’s reluctance to give way to allowing Vinay to have his meals with the ladies even though there are only three inmates. Heady ambition and the superfluous promotion of NGOs to build their reputation can be witnessed through the doctor at the home. A former dentist and now the administrator of the home, the doctor, or ‘dotor’, as Bonita refers to her, is determined to have the home win awards with her various plans to establish the perfect old age home. These are the attributes that scupper the process of converting an old age home into an actual ‘home’ for seniors, a place where they can experience love, respect, self-worth and exercise the faculties and gifts they possess. The humour in the play palpably enriches it on two levels – one, that it is simply hilarious, and second, that it has entrenched in it profound truths. Bonita asks Madhavi if she wants to dance when she meets her for the first time. To Madhavi asking why, she responds, ‘You’re into philosophy, are you?’ This exemplifies Bonita’s glib wit and emphasises Madhavi’s naiveté. The acting was impressive, especially the three main characters of Bonita (Karishma Alvares), Madhavi (Suvarna Bandekar) and Vinay (Kiran Bhandari). Marisse Bhobe as Sushila, Melanie Gareth as the doctor and Aryan Bhobe as Raphael deserve commendation too. The direction and script by Isabel Vas is difficult to fault. The witty lines induced uproarious laughter, yet did not depart from the message the play was attempting to convey. Humour is indeed one of the most efficacious ways of implanting the truth and propagating change…change to alter the perception of the natural process of aging, something that we will all encounter in this life.